Values-Driven Fisheries, Strength in Numbers! This post comes from Dawn Tucker with End-O-Main Lobster and fishing family out of Wickford, Rhode Island and was originally posted on the Northwest Atlantic Marine Alliance blog. My name is Dawn (McAlister) Tucker and I am a family member of a fisherman in Wickford, Rhode Island. We are a small day boat fishing business involved in several fisheries with a dragger, lobster boat and we are also aquaculturists. Since November of 2015 I have been working on initiatives to market (some of) our catch directly to the community. In Rhode Island this is a very daunting and expensive endeavor for small business fishermen. Through my research, I have come across and have tapped into several organizations that support direct marketing initiatives. LocalCatch.org is one network that falls right in line with my efforts. The fishermen in this group came together and created a core values document that I would like to share with fishermen, their families and communities everywhere. and you can also read more about them below. In addition, I'd like to share some other regional/national organizations that I learned about over the last 6 months. I think every small scale fisherman and their families should be aware of these folks if you are not already. Specifically in Rhode Island, I'd like to connect with other fishermen and their families who have the same interest to direct market. It seems as if we are way far behind what other states are accomplishing with this initiative. I have learned that fishermen are so busy fishing and dealing with fishery regulations, boat and crew maintenance, working long hours, that you do not have the time to be involved with what happens to our seafood when it comes off the boats. It's just easier to send it off to the dealers and be done even if direct marketing is something you are interested in. What happens to our seafood when it comes off the boat and into the food system is a completely whole other world. However, neither would exist without the other. I feel there is a layer missing here in Rhode Island that connects the fishermen to the community and I have been working feverishly to bridge this gap. My goals are to educate the community on our RI locally caught seafood and get the Department of Health regulations modified to increase access directly from the fishermen to the consumer through community supported fisheries, fishermen's co-ops, off the boat sales, pop-up dockside fishermens markets, or selling at farmers markets. I am also researching the possibility of a mobile seafood processing unit that would be accessible to all fishermen that could be moved from port to port. If you are in Rhode Island and are interested in direct marketing through, community supported fisheries, fishermens co-ops, off the boat sales, pop-up dockside fishermans markets, or selling at farmers markets, please send me a note of interest by July 31st, with your name, contact number/email, what fisheries you are involved in and what port you fish from to oscseafood@gmail.com. Here's a link to the fisherman's market in California. https://caseagrant.ucsd.edu/news/pacific-to-plate This is my major project, getting the workgroup together in RI that was in CA that made it happen. Some other things you should be aware of are that the students at the Universities and Culinary Schools are making great strides with leading food movements to source locally from farms and fishermen. 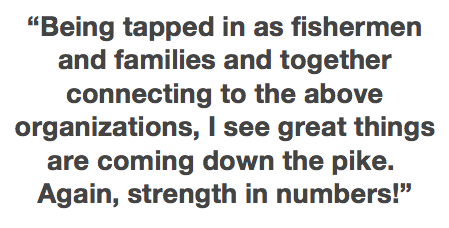 Being tapped in as fishermen and families, aligning around shared values, and connecting to the above organizations, I see great things are coming down the pike. Again, strength in numbers! Thanks for reading, please share this with your fishermen friends and families and I look forward to hearing from some of you in RI. Forward - The purpose of this document is for the LocalCatch.org network to express, align, and strengthen its shared values. These value statements aim to create a higher level of accountability and trust, both internally within the network and externally to the public, in order to advance the movement of Community Supported Fisheries (CSF) and like-minded community-based seafood operations. These value statements are intended to be addressed holistically and are not ranked according to importance. The values reflect our collective aspirations and what we are working toward, not necessarily what is the current status quo. We define ‘values’ as standards of behavior or one’s judgement over what is important in life. Community-based fisheries enhance the social, ecological, and cultural fabric of our coastal communities. At the heart of community-based fisheries are community-based fishermen* who live and work in the communities where they fish. They are typically independent, owner-operators*, and are inherently committed to the long-term health of the marine ecosystem. Seafood supply chains and policies should foster and strengthen community-based fisheries. Community-based fisheries cannot survive without equitable access* to the ocean commons. Fisheries access should be kept affordable, available to future generations, and connected to the communities where they are fished. The ocean and its resources should be held in public trust and not privatized*. Paying a fair price to fishermen, processors, and shore-side businesses helps support local economies and increases the quality of life for all those whose hands touch our fish. Community-based seafood should be available and affordable for all communities, and must be balanced against the needs and limits of the ocean as well as fishermen’s ability to sustain a livelihood with dignity and joy. Paying a fair price is also based on a conservation ethic where fishermen are able to attain higher value for lower volume of catch, which places less pressure on the fish stocks. Eating with the ecosystem means matching our seafood consumption to the rhythms of nature and place. It means celebrating and respecting a region’s marine biodiversity by harvesting a diversity of seafood and respecting the unique seasonality of every species and fishery. It means appreciating the ocean as a complex ecological system and engaging and educating consumers to enable them to become conscious consumers of the ocean’s food production capacity. fishermen, the public, consumers, retailers, wholesalers, managers and chefs. More direct and simple supply chains help maximize value to the fishermen and consumer. Information on who, how, where, and when a fish was caught, processed and distributed should be readily available to consumers. We encourage all seafood consumers to try local* first. From sea to table, strict levels of quality control and safe handling practices ensure that we honor the fish, its life, and its role in our food system. This also means minimizing waste by using the whole animal as much as possible, and educating consumers about how to make use of and care for the whole fish. Fisheries management is key for maintaining sustainable fish stocks and livelihoods. Management should be bottom-up, ecosystem-based, and foster collaboration between fishermen, scientists, policy makers, and the broader public. Management should combat illegal fishing, consolidation, and privatization. Management should also address non-fishing impacts that threaten the health of our fisheries, such as climate change, ocean acidification, and pollution. eating seafood and knowing who, what, when, and how a fish was caught, the public is taking the health of wild fisheries, coastal communities and the ocean into its own hands. Not only is the commitment to healthier marine ecosystems crucial, but it is also a moral imperative that ensures future generations will inherit a clean and healthy ocean. Building a better seafood system requires innovation, creativity, and thinking outside the box. It also requires that innovative ideas are not isolated but rather spread through a network of diverse stakeholders working together, aligning around shared values, and acting. Creativity and networking fosters knowledge sharing, collective understanding, and mentorship needed to build a better future. Fishermen: This is an inclusive and gender-neutral term for us, and the one used most commonly among women who fish in our network. It’s meant to refer to those who might also use the terms fish harvesters, fisherwomen, fishermisses, fishers, and intertidal gatherers, as well as those practicing restorative aquaculture on a sustainable scale. Community-based fishermen: Community-based fishermen live and work in the communities where they fish. They are typically independent, owner-operators and the bulk of the boat’s earned income circulates within close range of the community. This contrasts with fishing operations that extract money and resources from coastal communities and circulate them elsewhere, often carried out by large corporations or investors without community ties. Community-based fishermen operate small and medium scale boats that match the scale of the ecosystems where they fish. They are ecological experts attuned to the nuances of ocean rhythms, fish migration patterns, and spawning habitat. Community-based fishermen are part of the social fabric that builds identity and culture within a community. The term community-based also reminds us that what is possible in one region may not necessarily be possible in another due to differences in marine ecosystems, infrastructure, community interest, and more. Owner-operator: Owner-operators are holders of fishing rights (through licenses or other legal means) who also operate the vessel fishing, thus ensuring a direct connection between fisheries resources and the fisherman. The owner-operator principle has had a major positive effect in keeping fisheries access in the hands of community-based fishing fleets, which for many rural coastal communities is the largest private sector employer. Non owner-operators include holders of fishing rights who permanently hire captains and crew. Other examples consist of: speculative investors, industry processors looking to secure access, and retired fishermen who finance their entire retirement plan with no regard for a fair transition to next generation fishermen. The owner-operator principles also applies to businesses along the seafood supply chain whether its processing, operating a CSF, or a wholesale operation. We value control over these businesses remaining in the hands of those who are working the business, rather than far-away investors or companies that have no stake in the health or welfare of the community-based fishery. Access: Access refers to two distinct concepts. The first is related to access to fishing rights for community-based fishermen. Due to regulations (e.g. area closures and privatization), non-fishing impacts (e.g. climate change and pollution), and development (e.g. working waterfront displacement and development) access for community-based fishermen is constantly threatened. Access also refers to food access. The LocalCatch network stands for seafood suppliers who want to ensure that their high-quality seafood is made available whenever possible to regions and communities that face challenges associated with food security. Privatization: The act of transforming fishing access rights into monetary, private-property assets, which allows for the purchase of permits and quotas to consolidate upward to the most affluent, and often far-removed corporations. The ocean and its resources should be held in a public trust for current and future generations and not privatized. Nor should policies be designed to further consolidate fisheries access into fewer hands. Fair access to the ocean commons is supported by purchasing seafood from community based fishermen and by advocating for better policy that protect and promote, independent, owner-operators. Local Seafood: Defining “local seafood” is difficult and complex because “local” means different things depending on location, marine ecosystem, and more. For example, ‘local seafood’ to someone living in Alaska is very different from someone living in Omaha. Therefore rather than propose an all encompassing definition of “local seafood,” we provide some considerations we make when defining local in the context of our individual fisheries and communities. About LocalCatch.org: A community-of-practice that is made up of fisherman, organizers, researchers, and consumers from across North America that are committed to providing local, healthful, low-impact, and economy sustainable seafood via community supported fisheries (CSFs) and other direct marketing arrangements. We seek to increase the visibility and viability of community-based fishermen and aim to provide assistance to individuals and organizations that need support envisioning, designing, and implementing locally-relevant businesses that work towards a triple bottom line.